Here is a student using the Computer Center that was once located in Alumni Hall’s basement. Does anyone recognize her? It might surprise some people to learn that the most versatile and widely used part of Alumni Hall was not the classrooms or the theatre, but the basement. An April 1890 issue of the Coup d’Etat, a student newspaper, described the basement as intended to be used as an armory and a space for cadets for “company evolutions in winter and inclement weather.” The room also housed bathrooms and lockers, as well as a chemical laboratory. Although it appears its use was multipurpose from the beginning, the builders likely didn’t expect the many transformations the basement would see in future years. The lowest level of Alumni Hall has served as an indoor track, the Gizmo, a computer center, the mailroom, the gymnasium, the bookstore, a shooting range, and home to a few administrative offices. The basement was also the last part of the building to remain open and in use before all of Alumni Hall closed. The photo above is from the basement’s tenure as the school’s indoor track, taken in 1923. This track was state-of-the-art when it was constructed in the 1920s, as no other school in the area had one like it. 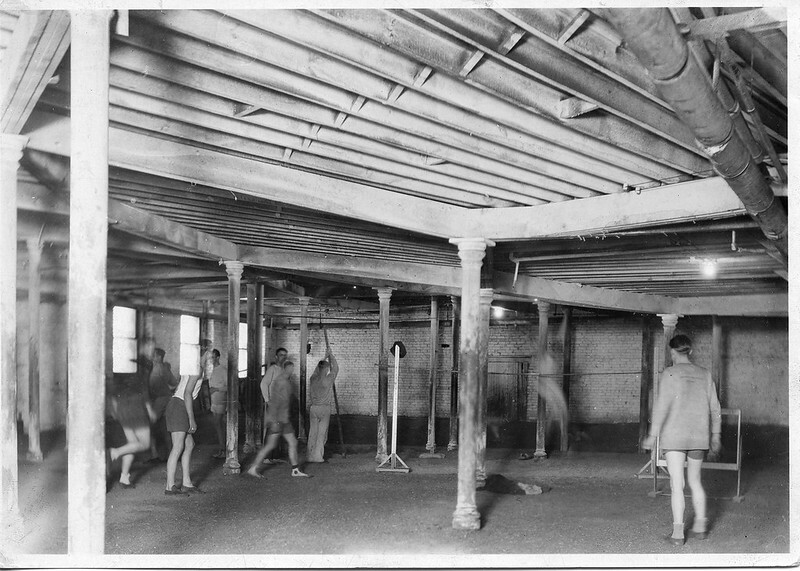 The 1927 Knox Alumnus described how the construction of the track, conducted by students and led by the track coach, “required the removal of several supporting posts in the basement.” The pits required for field sports like pole vaulting, shot put, and high jump were dug into the floor of the basement due to the low ceilings. The track stayed open until around 1940, and by 1946, the Hearth was opened in the east wing of the basement and the bookstore next to it followed a few years later. One of the most notorious uses of the basement was for a firing range. As students saw on our tour of the basement, there are still bullet holes that can be seen in the walls where the targets were placed. 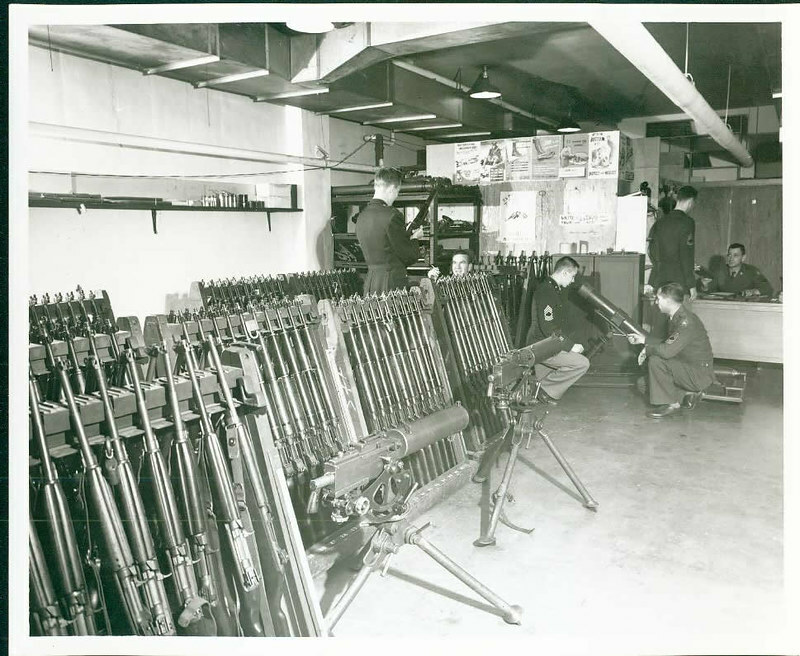 The rifle range is not the only part of Alumni Hall’s military history, though. Alumni Hall has served the campus during both World Wars as an important resource for soldiers. In 1943, during World War II, the Headquarters of the Air Force Training Detachment were housed in Alumni Hall. College campuses were utilized for the recruitment and training of soldiers. In 1944, the Army Specialized Training Unit was also housed in Alumni Hall. Alumni Hall was also the home of Knox’s ROTC program until it was discontinued in 1990. 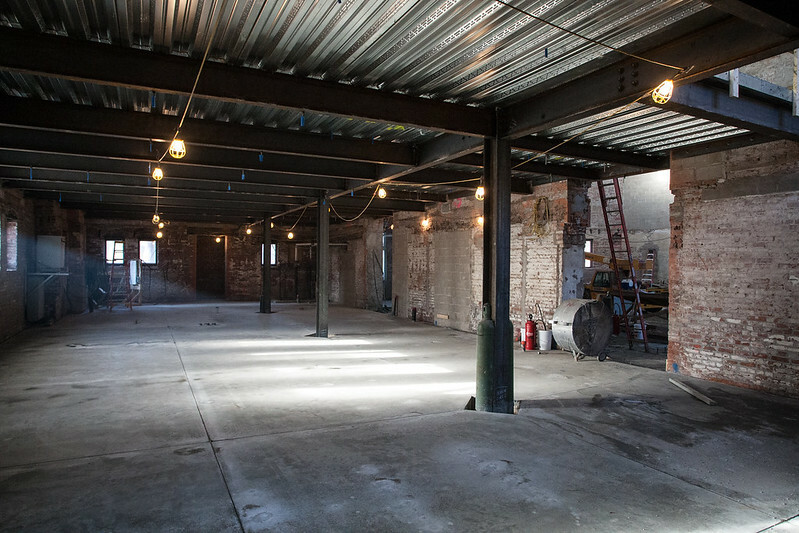 Poured concrete floor in one of the basement wings, also showing steel beams and steel panels for the floor above. 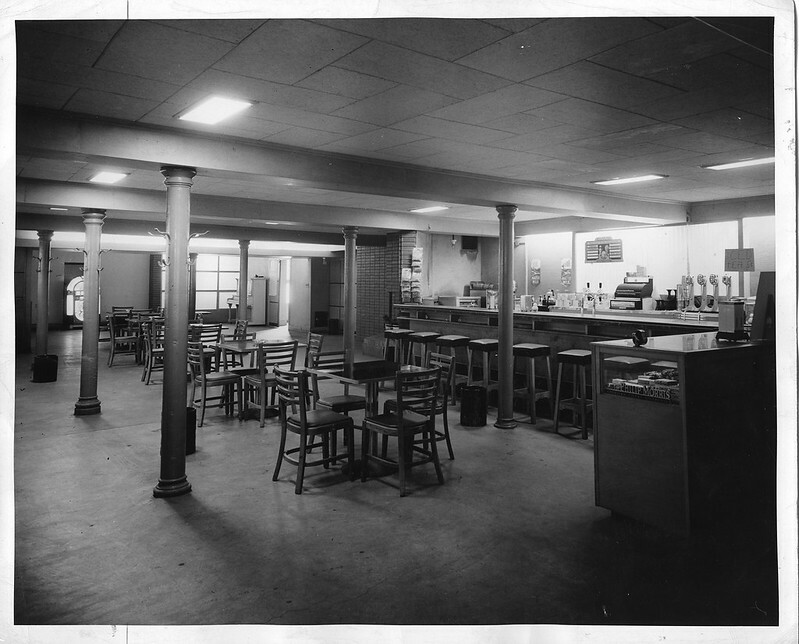 One of the most memorable uses of the basement of Alumni Hall was as the student snack bar. Originally called The Hearth, one of its namesake fireplaces is pictured at the rear of this photo. 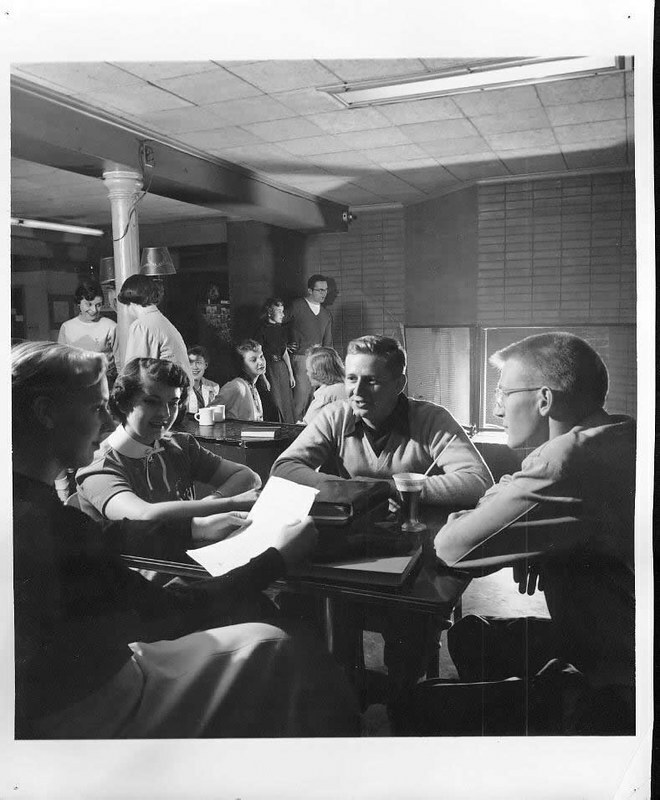 Students, like this group from the mid 1950’s, would gather to study and enjoy snacks in the basement around the hearth. At the time of our tour for students, the pictured hearth was still standing in the basement space of Alumni Hall. If this view seems strange, it’s because the original floor has been removed and we’re standing in what used to be the basement, looking up at the front door. The basement of Alumni Hall held auxiliary offices since 1950, but it was in 1977 that the Offices of Alumni Affairs, Development and Public Affairs were housed permanently in the basement. 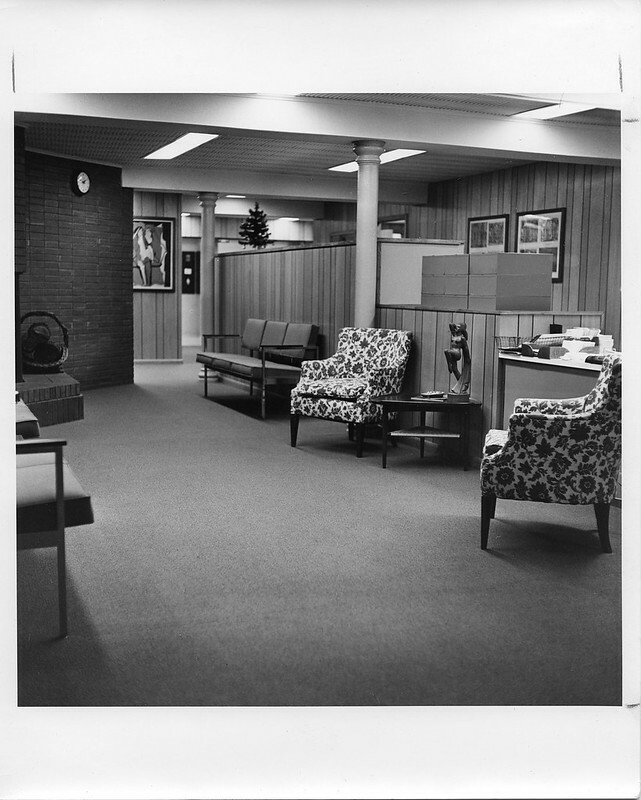 This is an example of what those offices looked like. Astute viewers will notice in the left side of this image that the brick structure is the old fireplace from when the space served as The Hearth. 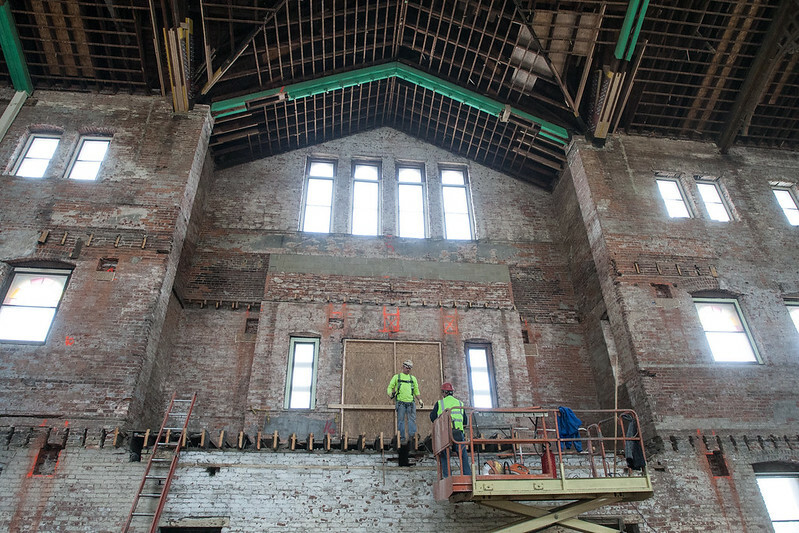 The transformed Alumni Hall will be home to many administrative offices once construction is completed. 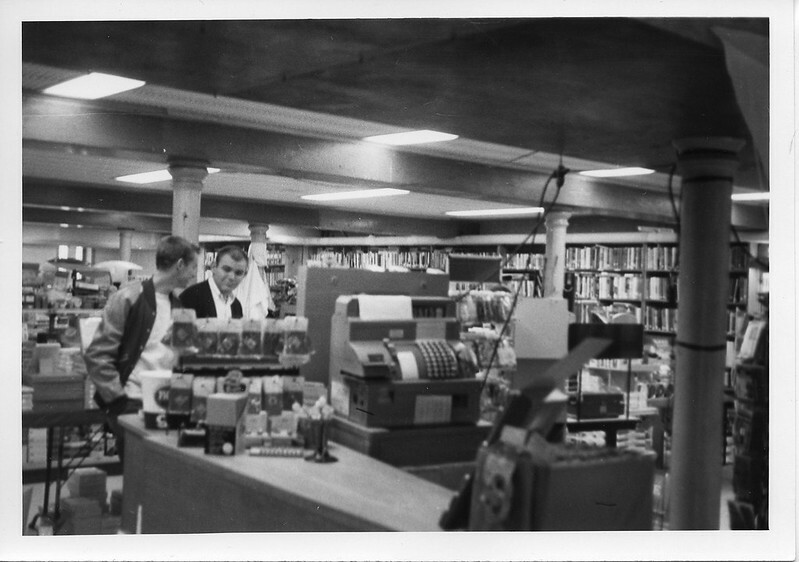 Starting in 1949, the Knox College Bookstore called the basement of Alumni Hall home. It was housed in the lowest level of the east wing next to the Hearth, later called the Gizmo, until the mid-1960’s. This shop for students was one of the many uses of the versatile basement space through the years. 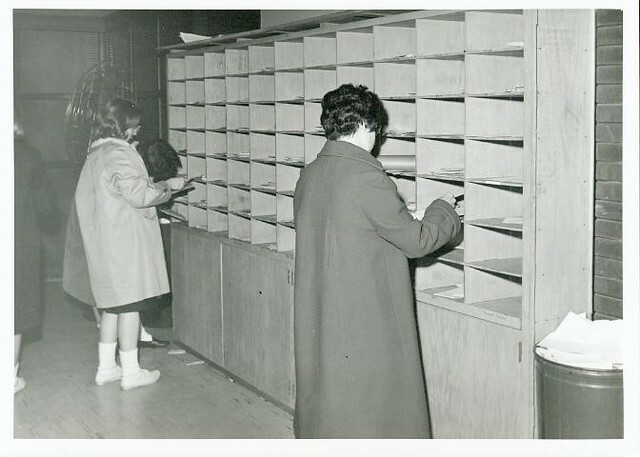 While current students find their mail in the lower level of Seymour Union, it wasn’t always that way. The mail room used to call the basement of Alumni Hall home, just like the Gizmo. We love hearing from alumni who remember Alumni Hall during its years of use as we explore its past. Dorothy Wharton ’55 has been an active commenter on the blog, sharing her memories with us, and this little bit she recalled inspired us to dig up this photo from the Archives: “We got our mail, in little cubbies, down there too, so there it was quite a mob scene at times.” Looks like the photographer caught the basement mail room in a calmer period here. Thanks for your comment, Dorothy! If you are an alumnus with a story about Alumni Hall, check out our Share Your Memories page. We would love to hear from you! Stay tuned for more on the many uses of the basement through the years: Alumni Hall’s lower level was home to much more than just the Gizmo and mail room. As an alumna recalled on the recent Homecoming weekend tour through Alumni Hall, the original location of the Gizmo was on the lowest level of the building. The Gizmo, however, wasn’t the original name for the student hangout, nor the original snack spot. In 1938, three enterprising Knox students started a food stand called The Goal Post, nicknamed The Geep. It was located near Williston Hall. One of the students, Ed Waldmire, would later go on to invent the corn dog. Little did Waldmire know, his creation would someday be a staple of Flunk Day lunches. The Geep became popular, and the College realized there was an untapped market for student snacking. The original Gizmo, first called The Hearth, opened in 1946 to “encourage students to stay on campus for food and fun,” as one article puts it. The Hearth featured, as its name suggests, two large fireplaces in the basement of Alumni Hall. We have student Howard Watt to thank for the original name. He won $15 for suggesting The Hearth in a contest held to name the new snack bar. The fireplaces were the gift of 1894 alumna Janet Grieg Post, who is also the namesake of Post Hall. In appearance, The Hearth was very modern for its time: pastel paints, indirect lighting, and upholstered booths. Some of these booths were claimed by Greek organizations and other groups as a designated hangout spot for their members. The Hearth was the heart of campus. It is unclear when it adopted its new and current name, the Gizmo, but it found its new location in the early 1960s, when the current Gizmo was constructed and snack bar operations were moved out of Alumni Hall. Do you have any memories of fond times shared with classmates in the original Gizmo? 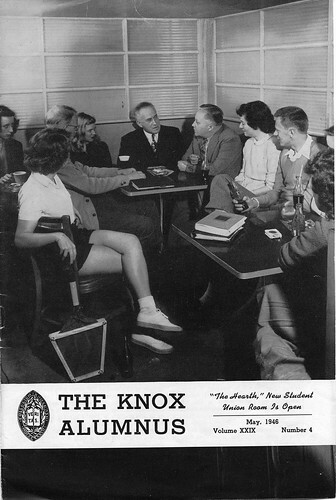 The May 1946 issue of the Knox Alumnus features the brand new snack bar.